Lock in a great price for Hotel Santa Rita – rated 9.1 by recent guests! My suite was spacious and comfortable. The views from my terraced were astounding! Very accessible to everything, enjoy walking and feeling the family spirt with genuine authentic food. Felt super safe with Santa Rita security measures! Best location in the city, clean and modern. Starbucks inside the hotel definitely a plus. We will return. Perfectly located, private parking, helpful staff... overall an outstanding experience! The foods that was included with my stay was very delicious the staff in the restaurant was very very nice overall was a great experience in the hotel. We will stay at this hotel again! Everything was great about this hotel. The location was great. Super clean. The breakfast was delicious! Starbucks is just downstairs. The cathedral is right next door. They helped us park. Great all around. We loved the location of the Santa Rita. We walked to many places feeling safe. The overall appearance of the hotel is bright and modern. The wait staff at breakfast were wonderful we felt like royalty. Breakfast was a great combination of lunch and breakfast so my husband and I were both happy. Excellent, Excellent for that group. We requested a balcony room and one was available. The balconies are small but we enjoyed sitting on the steps and watching the sights. Bed was super comfortable and the attention to all the details was great. Hotel Santa Rita This rating is a reflection of how the property compares to the industry standard when it comes to price, facilities and services available. It's based on a self-evaluation by the property. Use this rating to help choose your stay! One of our top picks in Zacatecas.Located in the historic center of Zacatecas and offering fantastic views of the Cathedral, Hotel Santa Rita features a spa, a restaurant and air-conditioned rooms with free Wi-Fi. The hotel offers a colonial-style façade and contemporary décor rooms with flat-screen TV, mini-bar and a private bathroom with free toiletries. 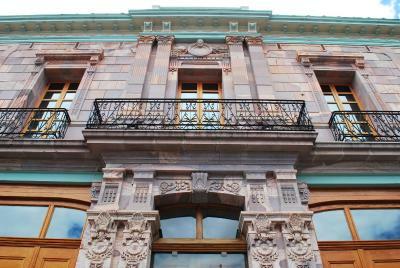 Hotel Santa Rita is close to the Fernando Calderón Theater and the Gonzalez Ortega Market. You can also walk to the Eden Mine and the cable car in approximately 10 minutes. Hotel Santa Rita is 40 minutes ‘drive from Jerez Magic Town and La Quemada archaeological site. When would you like to stay at Hotel Santa Rita? This air-conditioned room features a flat-screen TV, free WiFi, an interior view and a private bathroom. This room offers air conditioning/heating, flat screen TV with cable, free WiFi, private bathroom, and exterior view. (Window, terrace or balcony based on availability). This air-conditioned room features a flat-screen TV, free WiFi and a private bathroom with spa bath. Please note that rooms with a view of the city in this category are subject to availability. Art work by various local and national, internationally renown, artists is displayed and on sale throughout the hotel’s rooms and hallways. House Rules Hotel Santa Rita takes special requests – add in the next step! Hotel Santa Rita accepts these cards and reserves the right to temporarily hold an amount prior to arrival. Please note that reservations of 3 or more will be treated as a group for which different policies may apply. Breakfast is not included for children under 12 years old. No external window, but still bright. No English language television, but I could live without it. We made two requests for the couch to be set as a bed but nobody came. We asked for extra towels and nobody dropped clean ones off. Nothing negative to report, Santa Rita SPA is a must to do when you visit! There is not windows to outside only to the lobby so no view and the bedroom are very dark. Just at the gym was closed and the terrace was open only for events. I thought I can eat up there and have a view of the city. Bathroom smelled bad, poor room service and customer service . Can't really think of anything. Restaurant was good but I wouldn't say great. For a hotel that advertised itself as a 3 star hotel it felt more like a 5 star hotel. The service was great. Of course it helped that pretty well everyone we dealt with spoke English. But the staff were real friendly and helpful. They had smiles on their faces showing they actually enjoyed working there. There was some great modern art on the walls and in the lobby. Overall a really great hotel. They didn't turn down the bed, which would've been nice.